View More In Thermal Management Products. Be quiet! 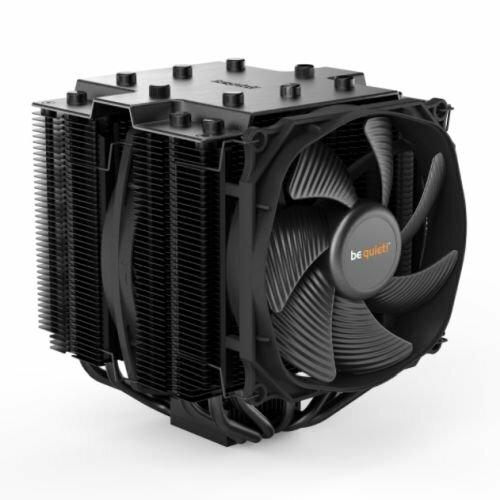 BK022 Dark Rock Pro 4 CPU Air Cooler, 250W TDP, Convenient Top Mounting, 6-Pole Fan Motor, FDB Bearing, 6 Heat pipes, Silent Wings135mm PWM Fan. The two Silent Wings PWM fans feature advanced fluid-dynamic bearings, smooth six-pole motors and airflow-optimized fan blades. The front Silent Wings 3 fan provides extremely high air pressure, thanks to a funnel-shaped air inlet in the frame. Decoupled fan mounting with vibration-isolating elements on the heat sink. No compromise in silence and performance for overclocked systems and demanding graphics applications! Dark Rock Pro 4 provides an impressive rating of 250W TDP and achieves low temperatures even during periods of peak CPU performance. Dark Rock Pro 4 is equipped with seven advanced technology 6mm copper heat pipes that maximize the heat conductance. Airflow-optimized, wave-contoured cooling fins with small dots on their surfaces increase the air circulation. The special black coating with ceramic particles makes a perfect transfer of heat possible. Dark Rock Pro 4 contains two aluminum heat sinks. The cutouts provided enhance its RAM compatibility. Two fans are pre-installed. It is also possible to add another 120mm fan for even better cooling. If you have any questions about this product by be quiet!, contact us by completing and submitting the form below. If you are looking for a specif part number, please include it with your message.